This marks the third year that First Light Solar has supported the team. They have directly supported our operations budget by writing the team some fat checks, which is amazing in this economic context, especially since First Light Solar is a relatively new company. Thanks to the entire First Light Solar team, many of whom are very active cyclists, for supporting us, but special thanks to Grant who used to work at Mars Hill and started the school’s cycling club before moving on to First Light. It’s a meaningful connection, one made all the more relevant by the solar panels that FLS installed atop residence halls and the cafeteria on campus. Give them a call and put some panels on your roof! Thanks a bunch, First Light! Organic Mechanic has also supported the team for three years by generously donating to our operations budget. OM is an original member of our “green” team of sponsors, and Asheville recently voted them the best vehicle repair shop in WNC for the sixth straight year! I think it’s because they’re so thorough in their work and inspections. If you go in for an oil change, they inspect your car from front to back and let you know about any issues so you can plan your maintenance schedule. With winter approaching, now is a great time to get your vehicle checked out. And if you mention Mars Hill Cycling, they will give you a $10 discount on any repair, and you can use this discount every time you visit. How cool is that? Thank you Charley, Nicki, and the entire OM team! Hearn’s is probably the oldest bike shop in the country, and they have some very cool antique bikes to prove it. Since the beginning, Clark and the team at Hearn’s have been there whenever we needed, no matter how big or small our needs. They help our riders with repairs and have helped get more than a few on new bikes. The most recent cool thing they did for the team? They supplied three of our riders with gravity bikes so they could compete in downhill, dual slalom, and four cross events in preparation for Collegiate Mountain Bike Nationals. They are officially the sponsor of Mar Hill’s growing gravity team, and we thank them for their generosity. Go visit Hearn’s at 28 Asheland Ave in downtown Asheville. Thanks Hearn’s! BioWheels is one of our newer sponsors. Our team is fortunate to have more than one bike shop sponsor, which is exceedingly rare for a cycling team and speaks to the overall tenor of Asheville’s cycling community. BioWheels stepped up to offer the team support this year, and are a great fit for our “green” team. They’ve hosted a mechanics workshop for the team, have loaned out tools when need, and have helped our women’s mountain bike team get on new bikes. Now’s a good time to check out their line of cyclocross bikes. Visit them at 81 Coxe Ave in downtown Asheville. Thank you Eric, Matt and the entire staff at BioWheels! Spin-Tech Training is the cycling performance center in town. They also do repairs and are now an official BMC dealer. They’ve provided our team with a travel trailer and have made a substantial cash donation to the team. The Mars Hill team has already been in twice this year for power testing, and so far every cyclist has improved their 20 minute power. What can be measured, can be improved, and it’s exciting and motivating for our riders to see that their training is indeed making them faster. Spin-Tech also offers blood lactate, VO2 max, and metabolic testing. They are THE cycling performance center in town, and we highly recommend reserving your time on a CompuTrainer now that cooler/wetter weather is on the way. Drop by any day, and you’ll likely see a Mars Hill rider or two getting some intervals in. Thanks O’Neil, Frank, Matt, and Jay for making us faster! Raw Revolution is another original member of our “green” team. Their bars are, as the name indicates, made of completely raw ingredients, meaning that nutrients make it into your blood stream much quicker than your typical cooked bar that places additional tax on your digestive system. They’re easy to eat and easy for the body to assimilate, and they taste great. Raw Rev has been a big supporter of all the events the team has promoted as well. Thank you very much for keeping us fueled. You can find Raw Rev locally at Earth Fare and Green Life. Thanks to Brian and the team at Raw Rev for your unwavering support! Ion Sports Nutrition continues its support of the team for the third year in a row. ISN provides the team with two drink mixes: the Competition Endurance formula, and the Ignition Sprint formula. Riders on the team have grown to love the product and have made it their go-to beverage for both training and racing. Ask your local shop about carrying ISN. Thanks to Eric and the folks at ISN for fueling us to our fist national championships last spring! 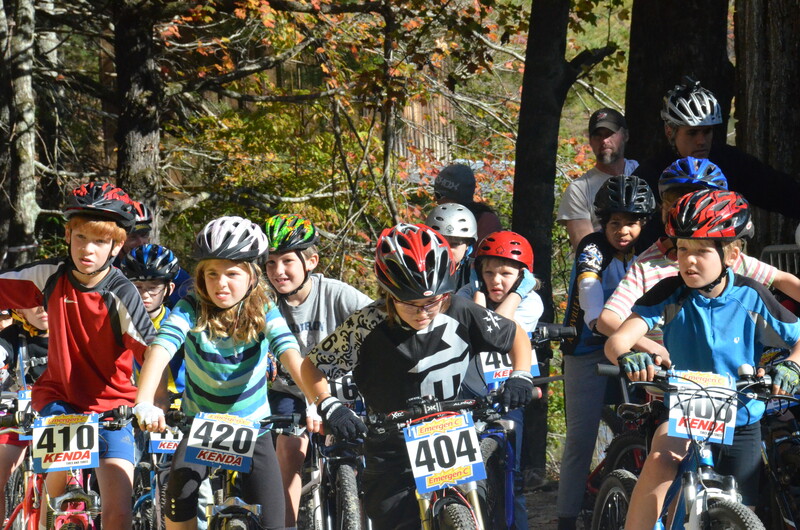 Asheville Bicycle Racing Club has been a tremendous partner for the last two years. Not only do they donate cash, but they also assist with our race promotion, trail building, and provide opportunities for our athletes to compete outside of collegiate racing. ABRC supports not just us, but also three other local collegiate programs, and we really appreciate all their efforts to support collegiate cycling and to continue to develop bike racing opportunities for everyone in the Asheville area. Thank you Marios and the 100+ membership of ABRC! DeFeet has been keeping our arms, legs, and feet warm and looking sharp for the last three years. Yes, their socks are great, but we are a firm believer that no one on the planet has invented a better arm warmer. Plus, their stuff lasts and keeps its shape. We have socks from three years ago that have seen thousands and thousands of miles, and they’re still performing. This is not to say that we don’t desperately need more socks, DeFeet. Can one ever have enough pairs of socks? Thanks Brad and DeFeet for keeping us stocked! Hincapie Sportswear has been our team kit supplier since the very beginning and will continue to be so for as long as we can imagine. The art department is great, the custom clothing department is so helpful, the product is unfailing, and the turnaround is surprisingly quick. We get solicited all the time by other apparel manufacturers, but we’re sticking with Hincapie because they haven’t given us a reason to leave and give us so many reasons to stay. Thanks to Rich, Scottie, Lauren and the rest of the Hincapie team! Of course, none of this would be possible without Mars Hill College. The administration has been great about increasing our resources as we’ve grown. They made us the cover of the new Mars Hill Magazine, which is a huge honor. They also bought the team a new mini-bus. Did I mention that they nearly tripled our budget over last year? Thanks to the president and his team for recognizing our success and promoting the team’s future growth. But we would be remiss if we didn’t also include in our thanks the rest of the MHC community. Faculty and staff from all the different departments have been keen to help and quick to voice their support. And then there are the parents who have stepped in to help with recruiting, officiating, sponsorship, and fundraising. Alumni and other supporters like Donald Dixon, Jay Hirst, Trevor Cartee, and Dotty Caudle have also stepped forward with generous cash support. And now that we have some graduates from the program, they’ve stepped up as young alumni to lend a hand in bike repair, graphic design, and coaching. We have a great thing going here, and we wouldn’t be on this upward trajectory without you. Thanks for everything! 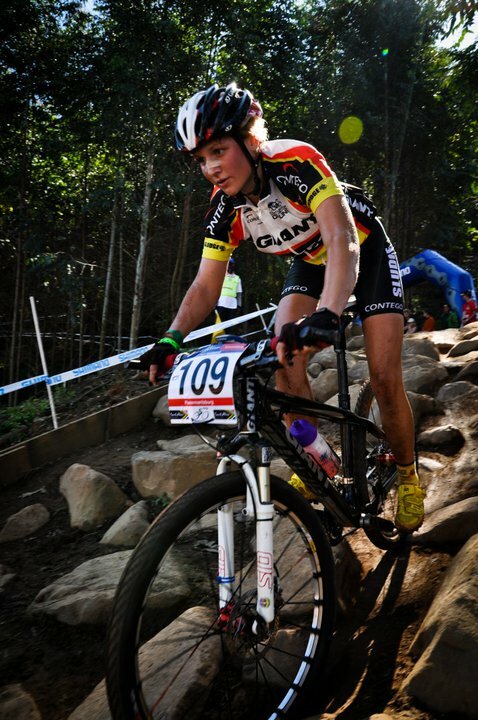 Mountain biking phenom Mariske Strauss will join the team in January 2012. Coming off a stellar 2011 campaign that saw the nineteen-year-old South African race to top ten finishes on the UCI World Cup circuit and place eighteenth at the UCI Mountain Bike World Championships, Strauss is one of the top upcoming mountain bikers in the world. With a professional road racing background as well, Strauss will help lead Mars Hill’s growing women’s team into the future. Strauss is the current South African cross country mountain bike champion, has represented South Africa at world championships the last four years, and has held a national title each of the last ten years. In 2012, Strauss will look to add collegiate victories to her resume, even as she continues to race an international calendar with an eye on selection to South Africa’s 2012 Olympic team. With an enthusiasm for new and big experiences, it won’t be long before Strauss makes an impact on the collegiate racing scene, where she looks forward to the challenge of competing in multiple disciplines. Strauss will race cyclocross and is eager to give track racing a try too. “I always put my wheel on the start line with winning in mind. I don’t come to races to finish second,” says Strauss, a spirited competitor who has overcome her share of setbacks and crashes along the way. 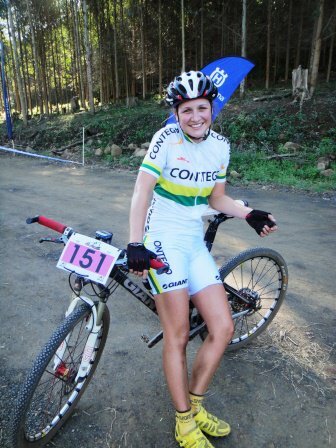 A broken pedal during the 75km Die Burger MTB Challenge in July took her out of the lead and into last place only 10km into the race. But Strauss fixed that pedal with her toolkit, worked her way back up through the field, and won the race by over four minutes. A fearless competitor: "You can never fall farther than the ground." A couple of weekends ago, Lacey, Corey, and I volunteered for CYMBL’s last race of the year at Falling Creek Camp in Tuxedo, NC. We had the opportunity to work with the younger side of the cycling community with CYMBL (Carolina Youth Mountain Bike League). It was awesome to see how energetic and excited these kids were to race their bikes. While we are usually a little nervous and jittery right before our collegiate races, these kids didn’t seem to have a thought in their minds about how well they performed. All they cared about was riding their bikes. It was a bit of an eye opener to us, and gave us a better understanding of why we really enjoy doing riding bikes. The atmosphere at CYMBL was very welcoming. There were tons of families having a good time. We especially enjoyed watching the dads, with their competitive natures, pushing their kids to pass the next kid on the trail. Although a few kids took a tumble, they were tough enough to get back on and finish their race. We had lots of great conversations with different families and were honored to be able to participate in this event, and even more, to see these kids having so much fun racing bikes. The event itself was one of the most organized races that I have been to. All of the races started right on time, and Todd Branham (the promoter) was super nice. The parents were very supportive too: whatever place their child came in, they were so happy that they were having fun. Towards the end, we stayed and watched the awards ceremony. The awards were super cool: gold cassettes and chain rings! A clever idea. Overall, we had a great time, and we look forward to going back next year and helping out again. Let’s start from the beginning. Last Wednesday, the team rolled out from Asheville airport with carry-on luggage and not much else. One bag was checked on, and of course everyone decided to add their own little bits and bobs to it…when we realised it was kinda overweight by 12lbs, Hugh “Airport Ninja” Moran worked his trickery and we sailed through without a hitch. Experience with travelling certainly pays off! We have much to learn from our wise coach. Most of the travelling, from Asheville to Houston to Albuquerque, went off without a hitch. However, the problem arose when we tried to pick up our checked bag on the other side. First we were told that the carousel crew went home because they thought with the thunderstorm going on, they didn’t have to do their job. First off, that’s stupid. Secondly, what?? No. Just, just no. Then we were informed that actually the bag is still in Houston and it will only reach New Mexico at noon the next day…yeah, not really ideal. But it gets better…we got word from Lees-McRae that a big ol’ snowstorm rolled into Angel Fire, where we were headed. So Hugh made an executive decision and we spent the night at a hotel so we could roll on out the next morning. So onto our final day of (unplanned) travel, in our awesome mad cool Toyota soccer mom car. Sans one checked bag. But that met us in the evening at our condo, thanks to FedEx courtesy of the airline. New Mexico is an awesome place though, I dig it! For us South Africans, it pretty much looks just like home. For reals. We loved it so much! And then the perfect song came on the satellite radio. Send Me on My Way by Rusted Root (http://www.youtube.com/watch?v=IGMabBGydC0&ob=av2e), which instantly became our theme song for the weekend. Cue terrible and enthusiastic singing by the whole team..
Friday dawned cold. Like, immaturely cold. Seriously, the weather was childish. But, even though the women had a ridiculously cold start, they had some frozen ground to help out on the course. Not so for the guys…Klara Rossouw and Laura Rice headed out onto their two lap race at 9.10am, with much enthusiasm and awesomeness. The race conditions were so terrible, the lap count was reduced. Yeah, that bad…I know right? Both the girls had real hard races, in crazy tough conditions, but they both came out pretty satisfied with their performances. Klara cracked the top ten with a 9th place, and Laura reached 21st in her first National Championship event ever. Talk about one stoked racer! In mad conditions, both girls showed determination and all ‘round badassery to finish the race with all they had and their results showed it. Ah yeah! The guys’ race was basically, to use a way overused cliché, a race of attrition. 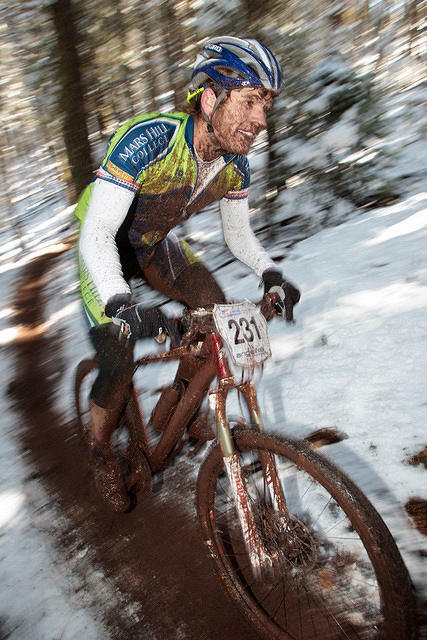 The mud and snow melted, causing the course to be near unrideable. Quite a few racers claimed to have ridden the uphill, but I’ll believe it when I see it. Personally, I reckon that 3mile mud hike-a-bike was a joke, it sucked! Our race started off real fast, with a mad scramble to be first into the singletrack climb. I was the first MHC rider into the treeline, with Tim Jenkinson hot on my rear wheel. Almost immediately, I had to drop into granny gear because of the carnage. Unfortunately my derailleur went from middle to off in no time at all. So while I wrestled with that, a big bunch of riders passed me. I couldn’t even restart properly, so I had to run. Unfortunately, almost every other rider had the same idea…I didn’t have the arm strength to get all ardgy-bardgy with them, so I quickly dropped back in the field. Not an ideal place to be really. Soon my teammate Corey Davis passed me, and that provided some inspiration to my racing ability. Going over the top of the climb, just behind Corey, the mud really came into play. That descent was one of the gnarliest, muddiest, most slippery and sketchy things I have ever seen and ridden. Also, it was AWESOME! Even though I couldn’t see a thing, despite wearing my glasses, it was sick. Mad berms, crazy slippery corners, incredibly dodgey everything….perfect recipe for rad cool riding! Then lap two started. Not so ideal. This time I had a bit of space around me, so I got off and started running. Muddy bike in tow. I just ran my bike up the mountain essentially, but it worked just fine. I passed like a whole bunch of people, so not too shabby really. I got pulled after my second lap, along with Corey and our fourth teammate, Maitland Jones. Tim finished our top rider in 9th spot, I finished next in 22nd, Corey came in 24th and Mait finished up 31st. So two top tens for Mars Hill in the XC then, not much to complain about. Saturday brought along the short track racing, traditionally our strongest discipline and the DH in the afternoon. Which is generally not our thing, as we’re not really gravity riders. However, Klara proved us wrong by having an absolute mad run and storming her way to 4th place. Baller! Tim and Corey rolled down the course pretty much, to get points for the team and not kill themselves in the process. Or that was the plan anyway…Unfortunately Corey had a mishap on the way down…OK, he smoked himself on a tree. Knocked himself out something epic. We think. We’re still not sure…either way, the guy has a concussion. Still, he rolled down in a pretty decent time! That’s MX skills for you. What a champ! Tim finished 30th, and Corey still managed 40th. That’s more points for the team! The STXC in the morning was brutal. 30mins of torture in ridiculous conditions at altitude. The perfect recipe for one heck of a sick race! Klara and Laura had yet another crazy hard race, with amazingly fast racers in their division. Klara raced to 9th again, showing her versatility as an all ‘round racer, and Laura beat her XC position with 20th. Top 20! Laura says she was real happy with her racing over the weekend, she felt like she was at the top of her game for the weekend. So a very successful weekend of racing for her! For the guys’ race, conditions were yet again just crazy. Luckily the temperatures increased, so the skinsuits were broken out for some speedwork. Again, the start was insanely fast so positioning was everything. Tim was ridiculous out of the blocks and got the hole shot. I was just outside the top ten, with Corey and Mait behind. After 3 laps, Mait was pulled. Which shows exactly how fast the competition was. Corey lasted a few more laps until he was pulled as well. Tim and I rode together for a few laps, until he pulled away. I knew he had better form than I did, so I paced him for a while to get his engine revving again and build up that motivation. It worked well, as he rode to a mad finish of 5th place. Podium! Booyah! I duked it out with another rider, and he pipped me to the line for 6th. So I finished in 7th place, another top ten for the team. I reckon I improved my position from the XC so much, because I was rocking a sweet pair of ski goggles. Yeeahhbuddy! Without a doubt the best idea I had the entire weekend. I had no problem seeing at all, it was great. But I’ll tell you what; we could all taste blood in our mouths after that race! Man, that was brutal. Hoo boy…. Sunday was the final day of racing. The dual slalom. For us, it came down to this racing that decided whether or not we made it onto podium for team omnium. Tim, Klara and Corey ripped The Hill, and brought it home! Corey unfortunately was still suffering heavily from his concussion and didn’t make it past the qualifiers. Both Tim and Klara got knocked out in their next rounds, but it was enough to get us on the podium! By 1 point I think it was…Standing on the podium with two other South East Conference teams was awesome, I’ll tell you what. And then seeing Tim and Klara standing on the podium for individual omnium, that was great! Overall, it was considered a good weekend for the team. 5th team omnium, 5th men’s individual omnium, 5th women’s individual omnium, 4th women’s DH, 5th men’s STXC, 7th men’s XC, 9th women’s STXC, 9th Men’s XC, and 9th women’s XC. So that’s 7 top ten finishes, 2 podiums and 3 omnium podiums. Not too shabby hey, not too shabby at all. Next year, we’ll be back and hungry for some top three medals! Angel Fire, New Mexico you have not seen the last of us! A big shout and thanks to SpinTech Training for keeping us in tip top shape, as well as getting our bikes Nationals race ready. To Hearn’s bike shop, for the generous loaning of three bikes for us to race our gravity events on. To Raw Revolution energy bars for fuelling us in the extremely cold weather, when we needed it most, and finally to Mars Hill College for providing us the opportunity to race in all the awesome places that we do. Without them, nothing we do could be possible!